It's that time. The order forms making the rounds at work. The tables perched outside of stores, tiny voices beckoning and imploring you for money. You can't avoid it. And of course, you cave. You're the proud owner of 15 boxes of Girl Scout cookies now, and wondering how you're going to get through all of them. Well, we have a tip: beer helps. 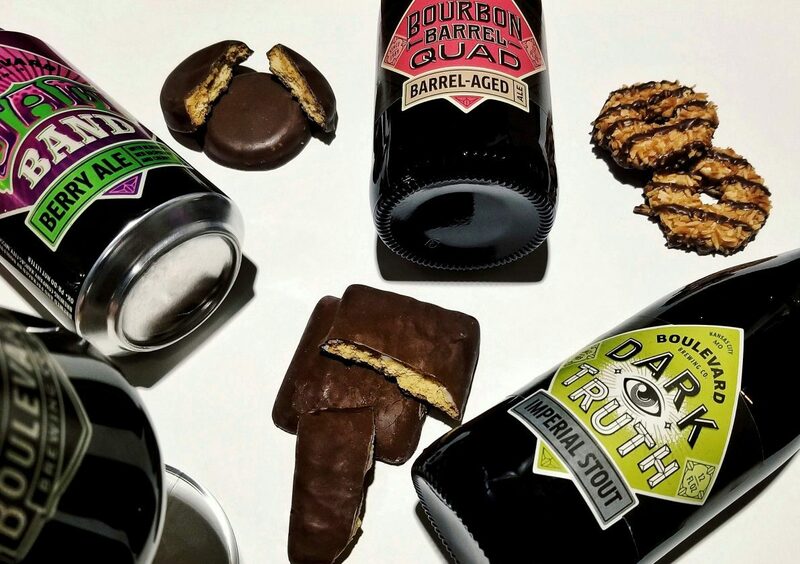 And it just so happens that those magically addicting cookies pair particularly well with a number of Boulevard beers. Here's a quick and easy guide to making that guilty pleasure feel even guiltier. Probably the most legendary (and possibly most divisive) Girl Scout cookie, Thin Mints can be found in the pantry (or freezers) of most homes starting in February. A porter or stout is a logical partner with these chocolate cookies, and our Dark Truth Imperial Stout's dark fruit and espresso flavors make it a particularly good choice. Complementary without being overpowering, the beer still allows subtle mint from the cookie to still shine through. Caramel deLites/Samoas have a lot going on. Coconut! Caramel! Delightful chocolate adornments! Our Bourbon Barrel Quad has quite a bit going on in its own right. A Belgian-style Quadrupel! Bourbon barrel-aging! Tart cherries! Through some kind of wizardry, this wild collection of elements manages to come together to create a harmonious menagerie that's a bit sweet, a bit fruity, and guaranteed to suddenly leave you wondering how you just finished off half a box of cookies in one sitting. Peanut butter. Jam. Need we say more? Okay, we'll say a little bit more. Since we first introduced Jam Band and its delightful blend of raspberry, blueberry and tart cherry, we felt that it was destined for pairing with peanut butter. And fortunately, there are TWO Girl Scout cookie options to help you revisit that nostalgic PB&J flavor combination. For a straight up, classic approach, go with the Peanut Butter Sandwich (or Do-si-dos, for some of you). But if you feel the need to add an extra layer of lusciousness with some chocolate (and how could we blame you? ), break out the Peanut Butter Patties (aka Tagalongs) and wash it down with our Berry Ale. The Girl Scout twist on S'Mores may not be a perfect replacement for the real thing, but they're a passable representation of the signature camp treat. Now, paired with our Whiskey Barrel Stout? Things get taken up a notch. The chocolate, graham and marshmallow creme components of the cookie are boosted by the chocolate, espresso and vanilla elements found in our barrel-aged imperial stout. The end result is a sinfully sweet, whiskey-tinged combination that could be enjoyed around a bonfire or just curled up on your couch. Unfiltered Wheat Beer and lemon has become a nearly ubiquitous matchup; you'd be hard-pressed to order a Wheat at a bar and not have it arrive at your table adorned with a lemon wedge. So why not spin that bready, citrus combo into a killer and unexpected dessert pairing? Those tricky Girl Scouts offer up two lemon-focused cookies: Lemonades (shortbread with lemon icing) and Savannah Smiles (lemon cookies dusted with powdered sugar). No matter which one is available in your region, you'll be taken aback by how it makes a perfect companion to our hazy, classic wheat beer. Shortbread cookies are pretty simple and straightforward. These sweet, slightly buttery cookies can honestly pair with just about anything. But, we personally dig how the way they complement our newest year-round beer, Space Camper Cosmic IPA. The cookie's sweetness helps elevate and highlight the juicy, tropical fruit notes imparted by Space Camper's heavy late and dry-hopping. As a result, you get a beautifully satisfying, well-rounded bite that's almost reminiscent of a fruit tart.